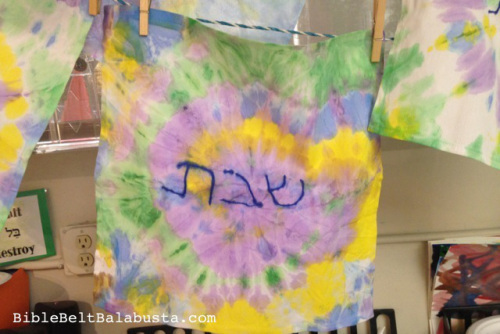 "I wrote about at-the-sink tie-dye challah covers with kids, using diluted acrylic paint in squeeze bottles. The paint was free, the dyeing was fast and easy, and the results were gorgeous. Now, I’ve fixed my one regret: that I had to pencil the Hebrew letters on each cloth before class. I’d rather kids do as much of the work as possible, even if they don’t know Hebrew letters yet. Kids don’t learn when adults do the work. This time, I found a solution. Kindergarteners trace שּבת themselves. Not with fiddly stencils, but by writing atop letters taped to the underside of the cloth." 17: Challah-ween: Is Judaism at odds with Halloween?